Today we focus on diabetes basics. Diabetes is a disease in which education is vital. 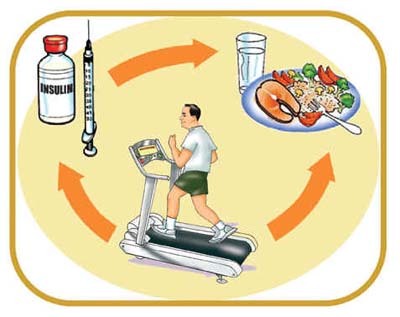 For a diabetic, knowing the disease well allows him or her to better prevent long-term consequences of the disease. It also allows the diabetic to make real-time adjustments when sick or otherwise in danger acutely. In Straight, No Chaser, we’ve provided a series of posts meant to empower diabetics (and you can review any or all of them via the search box on the right). Remember, it all should start with a basic understanding of the disease. We eat, and the process of digestion is for the purpose of converting food into glucose (sugar) that’s used by our body for energy. The blood delivers the glucose to different organs of the body where the cells take it up for use. In order for that process to work, an organ that’s part of the digestive tract called the pancreas has to produce a hormone called insulin. Insulin facilitates the glucose getting from the blood to inside the cells. Diabetes is a disease where insulin isn’t being made by the pancreas or isn’t working optimally. Now think about what happens when you’re not getting sugar into your cells. It’s as if you’re starving (because physiologically, you might as well be). You get symptoms such as weight loss, hunger, fatigue and excessive thirst. Because your cells don’t have energy, they aren’t functioning well. In fact, blood and nerve vessels lose significant function, resulting in significant vision loss and lack of sensitivity in your extremities. Anyone who’s been a diabetic for about 10 years know this because you’re wearing glasses and because you’ve lost a fair amount of sensation, especially in your feet. There are other symptoms that are variations of the same theme, including excessive urination, dry skin, increased infection rate and slower healing from those infections – all due to poor function of your blood vessels. Sometimes diabetes is a disease that happens to you because of unlucky genetics (or simply a family history). Other times it is a disease that you find. Risk factors for developing diabetes includes obesity, older age, and physical inactivity. Gestational diabetes (i.e. that occurring during pregnancy) is an entirely different conversation. Let’s take a moment to discuss prevention and treatment. There are different types of diabetes, but the risk of one form of diabetes in particular can be reduced by – you guessed it – diet and exercise. In fact, diet, exercise and medications are the three legs of the diabetes treatment stool regardless of type. Some patients require regular insulin injections and others require pills. Still others who are successful with diet and exercise are able to markedly reduce, and in some instances eliminate medications. If you’re a diabetic, make an investment in your education. It could not only save your legs or eyes, but it may just save your life. I welcome your questions and comments. Ask your SMA expert consultant any questions you may have on this topic. Also, take the #72HoursChallenge, and join the community. Additionally, as a thank you, we’re offering you a complimentary 30-day membership at www.72hourslife.com. Just use the code #NoChaser, and yes, it’s ok if you share! Order your copy of Dr. Sterling’s books There are 72 Hours in a Day: Using Efficiency to Better Enjoy Every Part of Your Life and The 72 Hours in a Day Workbook: The Journey to The 72 Hours Life in 72 Days at Amazon or at www.jeffreysterlingbooks.com. Another free benefit to our readers is introductory pricing with multiple orders and bundles! Thanks for liking and following Straight, No Chaser! This public service provides a sample of http://www.SterlingMedicalAdvice.com (SMA) and 844-SMA-TALK. Likewise, please share our page with your friends on WordPress! Also like us on Facebook @ SterlingMedicalAdvice.com! Follow us on Twitter at @asksterlingmd.